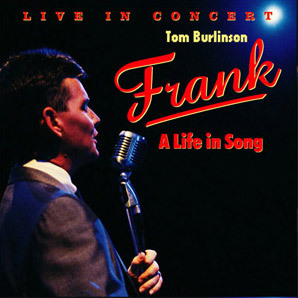 ‘Frank – A Life in Song’ was performed again at various venues in 2013. 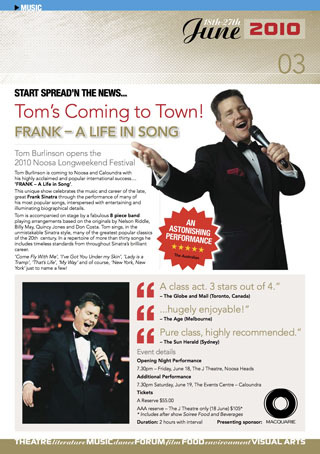 This will continue in 2014, as well as a regional tour of ‘Simply Sinatra’ with a 5 piece band. Check out the dates and places in the ‘Now We’re Swingin’!’ drop down section. 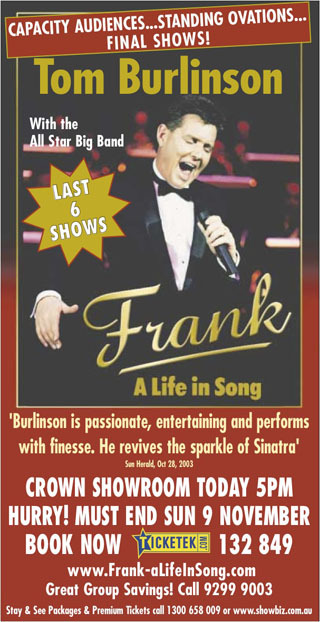 My show ‘Frank – A Life in Song’ began as essentially a concert in a theatrical setting, divided into two acts. 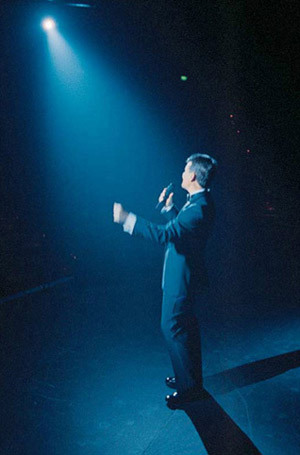 I sang more than 25 songs from throughout Sinatra’s career, accompanied by a 16- piece band on stage with me. I didn’t impersonate Frank, but I sang very much in the Sinatra style. Between the songs I talked directly to the audience, providing biographical details and entertaining anecdotes, always focusing on the music of the man. These passages helped to illustrate the concept that Frank’s choice of material and particular expressions of songs were often a reflection on what was happening in his life. I was joined at times by two dancers, who also took the stage by themselves later in the show for an exciting tap routine to an instrumental version of ‘That Old Black Magic’. Towards the end of the show I talked about the effect that Sinatra has had on my life and sang a song I wrote in tribute to him called ‘The Man in the Hat’. Then came the final numbers – ‘My Way’ and, of course, ‘New York, New York’. We performed the show this way, with minor alterations, from 1998 to early 2003. When I went to the Showroom at Star City, Sydney in May 2003, many of these elements remained, but the dancers were cut, some new songs were added, the monologue was edited and the performance became more like a Las Vegas floor show, albeit a long one! 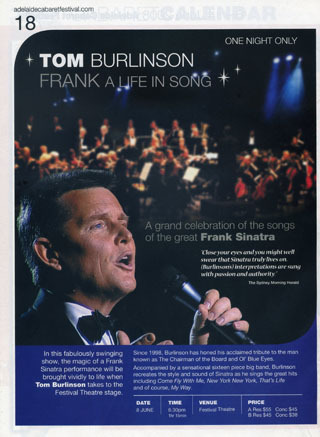 In February 1998 I performed in a series of open-air concerts at Taronga Zoo with the Australian Army Band (Sydney) in ‘A Tribute to Frank Sinatra’. As preparation I’d chosen the songs, had musical arrangements done and written short linking monologue pieces. I’d also asked my wife, Mandy Carnie and our friend, Keith Hawley, to co-choreograph and dance in routines to a few of the numbers. This was to provide not only a different interpretation of the music, but also some energetic visual impact. These shows were very well supported and became a ‘try-out’ for a bigger production I had in mind. My love for the music of Frank Sinatra goes back to my early childhood. As a young adult I found I could imitate him quite well, due to a natural similarity in vocal range and tone as well as having a ‘good ear’ and doing lots of study and practice. I’d been honoured to be chosen to sing the voice of the young Frank in the Warner Bros. mini-series ‘Sinatra‘, produced by Frank’s daughter, Tina, in 1992. Now I intended to produce a live show as a celebration of the music and career of the great man. As I wanted to retain creative control over the project I decided to produce it myself, so Mandy and I took a mortgage on our house to finance the initial costs. I employed an established theatrical producer, Zoltan Koteczky, to assist me in the production effort, and my agent, John Cann, was also made an Executive Producer. We booked a limited two-week season in the York Theatre at the Seymour Centre in Sydney. I’d been encouraged in this endeavour for some time by a musician associate named Ralph Pyl, a trumpet player who leads the Sydney All Star Big Band, which we engaged. 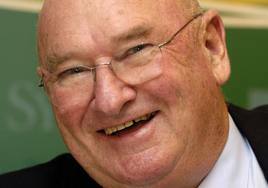 I also asked pianist Michael Harrison, another musical acquaintance, to be the Musical Director. We commenced rehearsals of arrangements of Sinatra songs based on the originals. The song list and monologue links were expanded and another dance routine was added to what had been done at the Zoo. I employed the services of Lighting Designer Damien Cooper, Sound Director Dave Cafe, Company Manager Amanda Ferguson, Publicist Judith Johnson and Box Office Consultant Wendi Todd who made our initial ‘team’ complete. Publicity commenced and ticket sales were well under way when two weeks to the day before we were due to open the world heard the news that Frank Sinatra had died. I didn’t know what to do. The show was meant to celebrate Frank while he was still with us. Now I was well aware that we might be seen to be ‘cashing in’ on the man’s death, and I took great pains with the media to explain that this was not the case. However, I must admit that although the timing was purely coincidental, the ensuing publicity about the passing of one of the legendary figures of 20th Century entertainment attracted added interest in my show. We opened on May 29th, 1998. With the benefit of good reviews and a very positive audience reaction, we were able to extend that initial Sydney season from two weeks to five and a half, and to make arrangements for a national tour. The show played successfully at the Comedy Theatre in Melbourne, Her Majesty’s in Adelaide, the Civic in Newcastle and the Playhouse at the Queensland Performing Arts Complex in Brisbane from July to October, 1998. A return to Sydney at the much larger capacity Capitol Theatre led to sold out performances over two weekends. 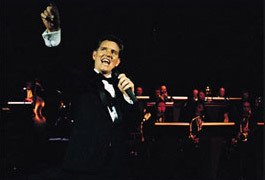 An engagement at the Burswood Theatre in Perth in January 1999 completed the national tour, before a final sell out return season in Melbourne, again at the Comedy, in February. My wife Mandy had become pregnant in July the previous year, and consequently our friend Leanne Mauchlan replaced her in the show from the Adelaide season on. Mandy was now in the late stages of pregnancy, and we decided to ‘put the show to bed’ for a while and take some time as new parents. More than two years later, soon after the birth of our second child in March 2001, we were asked to re-mount ‘Frank’ for the inaugural Adelaide Cabaret Festival, held in May. With some changes to our production team and Mandy returning as our female dancer, we played to capacity houses in the 1900 seat Festival Theatre over two nights. Then the management at the Capitol Theatre, Sydney invited us back yet again. We performed 5 shows over two weekends in August/September, attended by more than 8800 people. 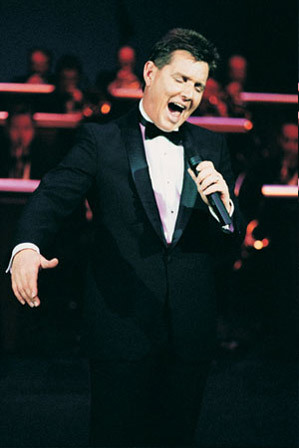 I received a ‘Mo’ Award nomination for Australian Performer of the Year in 1998. I thought this recording would never be made. 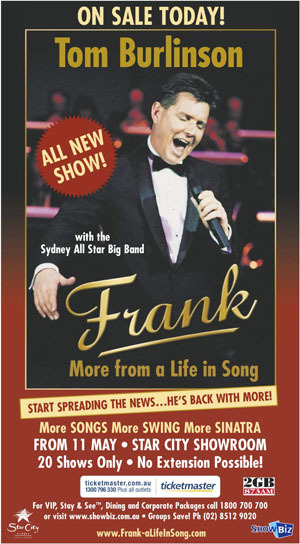 Although the creation of the show ‘Frank – A Life in Song’ was the realisation of a life-long passion for me, my thinking was that if people wanted to listen to these songs, sung in this style, they would go to the source of the inspiration and buy the originals. ‘To remember the magical experience of the evening!’. I was already proud of the fine work of the musicians we’d assembled some of Australia’s best and most experienced big band jazz players, so when we realised that the acoustics of the York Theatre at the Seymour Centre complimented the music perfectly, the decision to make a live recording of the songs in the show was made. We wanted to capture the vitality of the live experience, complete with the inherent imperfections of that process, rather than attempt to recreate the mood in the sometimes sterile atmosphere of the recording studio. Here is the result of our efforts. What you will hear is as it was played and sung – no overdubs have been added. We hope you will enjoy. 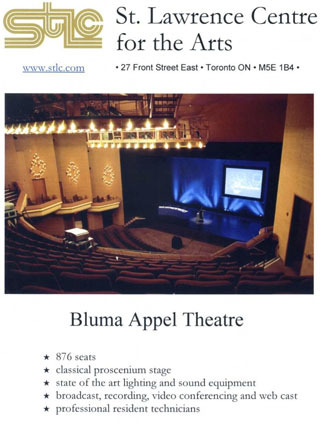 In mid 2002 we took the show to Toronto, Canada for a run in the Bluma Appel Theatre at the St. Lawrence Centre for the Arts. We took five musicians from Australia (Michael Harrison, Ralph Pyl, Mark Taylor, Gordon Rytmeister and Dave Pudney), two dancers (Mandy Carnie and Aaron Cash), Sound Director Phil Meltzer, Lighting Designer Damien Cooper as well as Executive Producer John Cann and myself! We contracted eleven local musicians to make up the big band. This enterprise turned out to be a financial disaster. Summer in Toronto is traditionally “out-of-season” for theatre, and we struggled to sell enough tickets to even come close to breaking even. We were certainly not helped by negative reviews from three out of the four major newspapers. Radio and TV commentators were much more complimentary (See below). However, over the five week run, at every single performance there was a standing ovation, and, more often than not, two! So I remember the experience as an artistic success, if not a financial one. We learnt a lot, everyone we employed were paid, and the only ones who lost money were my great friend and supporter John Cann, who despite all his hard work, was on a percentage of profit deal, so made nothing, and myself, who lost a great deal! Consequently this venture did not turn out to be the introduction to the North American market that we had hoped. 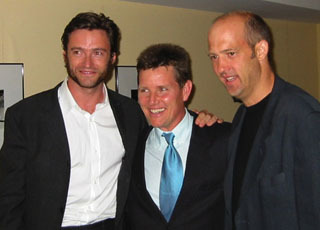 With my friends Hugh Jackman and Anthony Edwards at the Premiere. Early in 2003 the Queensland Performing Arts Centre invited us to return to Brisbane once again for a three week season of the show in the main Lyric Theatre. The Courier-Mail reviewer wrote that I “recreated the Sinatra myth with superb artistic skill”. During the run we played to almost 13,000 people and made a tidy profit. After Toronto, it was a much-needed confidence boost! Soon after the Brisbane run we were asked by the Entertainment Manager at Star City Casino in Sydney, Ross Cunningham, if we would like to bring the show to the Showroom there. The run of another production had come to a premature end, and a short gap in their schedule had to be filled. This opportunity developed into an extraordinary success. I had only ever performed the show in ‘legitimate’ theatres. The Showroom was more of a Las Vegas type room with booths and tables where patrons could have alcoholic drinks bought from an adjacent bar. A more informal, relaxed setting, that required more of a floorshow format. Partly for reasons of space on stage and partly in accordance with this less theatrical atmosphere, I decided to no longer have the dancers in the show. It was now just me and the sixteen-piece Sydney All Star Big Band. I also edited the monologue and added some new songs. Soon after the show was put on sale and advertising began it became clear that something special was happening. Ticket sales were very strong. So much so that during the run we realised that demand would exceed the capacity! Instead of disappointing potential customers it was decided that we should have a return season in late September/early October that same year. The run in May had been just twelve shows and thirteen more were performed in the return season. More than twenty thousand people had attended! We decided that this was the perfect time to record the show for DVD release. Cameras and recording equipment were brought into the Showroom over two nights, then edited, mixed, and mastered. We also recorded interviews with some of the key people involved for a ‘behind the scenes’ documentary to be included. Upon completion Village Roadshow agreed to distribute the DVD, so the show was now available to the public at large! After the extraordinary success of the Sydney seasons, we were invited to the Crown Showroom at Crown Casino in Melbourne for a run of 15 shows in October/November. I thought at the time these would be the last performances of the show, as we’d played the major cities several times during the previous five and a half years, and I already knew that I would be involved for an extended time in ‘The Producers’ from early 2004. After our two seasons at the Comedy Theatre in 1998 and 1999, this was our third run in Melbourne, still more than 9000 people came to see us at Crown. After ‘The Producers’ finished in late 2005 Ross Cunningham approached us with the idea of yet another season of ‘Frank’ in the Showroom. I was reluctant to do the same show again, but decided that a sort of sequel might work. I added lots of new songs and wrote new linking monologues, as well as including reprise performances of some of the ‘classics’. I used to say it was “more of the same, only different!” We booked dates in May and June. As you can see we used the same photo in the marketing and advertising of the show, and this turned out to be a mistake. Despite the “ALL NEW SHOW!” starburst and the repetition of “More”, many people thought it was the same show as the original that they had seen. We were also persuaded to put all 20 shows on sale at once, rather than releasing new seats as the run progressed, which also proved to be too ambitious. We had to give away lots of complimentary tickets to the first few shows in order to ‘fill up the room’. There were a couple of lukewarm reviews, particularly directed at the first half. Nevertheless, another 10,000 people paid to see it! I decided to re-work ‘Frank-More from a Life in Song’. I changed some songs and wrote some new links to improve the First Act. New marketing and advertising imagery was created as well as a new title: ‘The Best of Frank’. We took this to the newly renovated showroom at Crown in Melbourne now called The Palms. A great room for this kind of show. We booked a run of just 8 shows there in October. With the benefit of hindsight the new advertising material now looks a bit old-fashioned and ‘cheesy’. 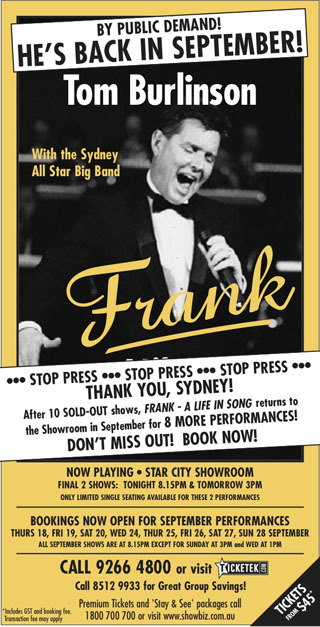 However, in this our fourth season of ‘Frank’ shows in Melbourne we played to 70% capacity of more than 5000 people. In April I was asked to perform with the big band at the 70th birthday celebration of the transport magnate Lindsay Fox (pictured right), at his home in Sydney. 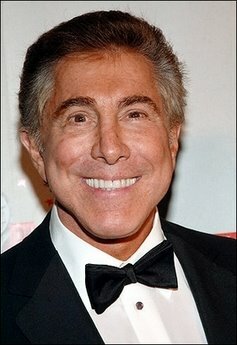 Also present at the party was one of the true moguls of modern Las Vegas, Steve Wynn (pictured below). He greatly enjoyed the performance and asked to meet me after the show. He said “I’d like to get you to Vegas”. 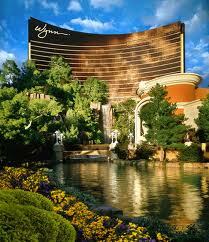 Well, true to his word he arranged for me and John Cann and six of my regular Australian musicians to fly to Wynn Resort, Las Vegas (pictured below right) in December that year. The occasion was the 60th birthday party of his CEO Marc Schorr. Along with 10 local musicians to make up the big band, we were the featured entertainment for the night. Needless to say, this was a very exciting event for all of us, even though it was for only one night! 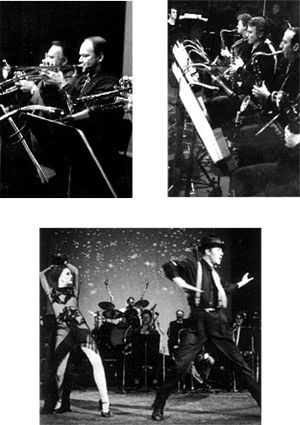 After our performance at the Festival in 2001, we were asked to return in 2008. Only one performance, but the big Festival Theatre was sold out! We were approached by producers Tim Woods and Phil Bathols to perform in the Concert Hall. It seemed to be a most appropriate venue for the ten year anniversary of the show. 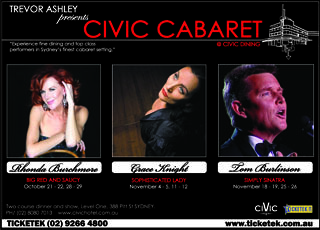 Performer/Producer Trevor Ashley asked me to be a part of the premiere season of cabaret shows at the Civic Hotel. It’s an intimate venue with a small stage, so we created ‘Simply Sinatra’ with just piano, bass and drums accompaniment. It worked fine, but I did miss the horns in the arrangements! The General Manager, Ian MacKellar invited me to open the Festival. Played in the J Theatre, accompanied by the 8 piece band. Also performed the following night in Caloundra.